Cranium was formed in 1997 in Medan, Sumatra, Indonesia. The early formation of Cranium was Avec (guitar) Obed (drums) Denni (bass) Windy (vocals) and in 1998 the band released the Cranium mini-album “Misunderstanding”. Then in 1999 Obed (drums) resigned and was replaced by Faisal, and not long after Dede fill the position on the second guitar. 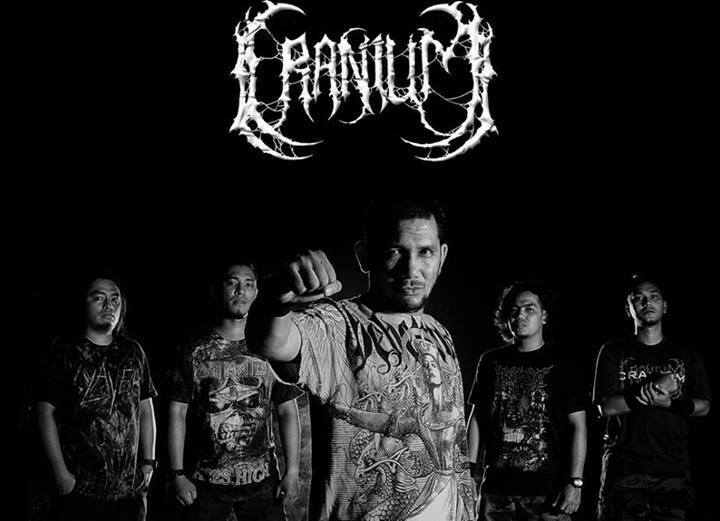 With new lineup Cranium released the full-length album “Rotten in Nocturnal Aggression” in 2001 under the banner of the legendary ESP label in Bandung. Not long after this Avec left Cranium. In 2006 the bands vocalist Windy had an accident and left us all .. Cranium experienced 2 years of turmil until we found Nanda in 2008, filling the void. In early January 2012 we released a new full album entitled “Perintah Dunia Baru” ( New World Orders) under the banner of Rottrevore Records Jakarta. In 2013 Cranium Faisal Retorica joined the band to strengthen Cranium as the second guitar player. Now the formation consisted of Dede (guitar 1) Faisal Retorica (guitar 2) Denni (bass) Nanda (vocals) Faisal (drums). Cranium can be interpreted as a straightforward human skull, we symbolize Cranium as the skull that protects the human brain – the source of all ideas, visions and missions of mankind in this world, which often results in the destruction of human kindness or one´s self destruction. It did not come here from nowhere, it derived from the contents of the skull base of human beings. So thats why we take CRANIUM as the name of our band!